Diving more into Backbone, SASS, and a new scaffolding workflow I came across (yeoman), I decided to also play around with the webkitSpeechRecognition api. This todo list widget will save locally a list of items you want to get done. 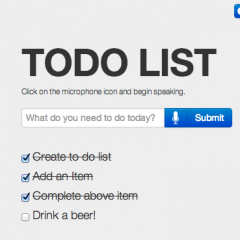 If you use a webkit browser (Chrome), it will also allow you to use voice to add items to your list. I am starting to appreciate Backbone much more (even though its a headache at first). The Yeoman Generators helped kickstart the project in a matter of seconds, and who doesn’t love SASS? Note: The Speech Recognition only works in Chrome.